Cascade, Plymouth, Skacel, Frog Tree Yarns, and more! Come in and see for yourself the wide selection of local fiber for spinning and felting, locally spun and dyed yarn, new and used needles, hooks and books, unique stitch markers and notions, and hand-made tools. Wool from local sheep, alpaca, and even yak are showcased on these walls, as well as the work from talented local dyers. The Yarn Underground is here to bring you squishy yarn, irresistable fiber, affordable tools, and most importantly, good help. Come meet the owner, Shelley–she is here just about all the time, and loves to answer your questions and help get your project back on track. She is also the head dyer of Palouse Yarn Company. 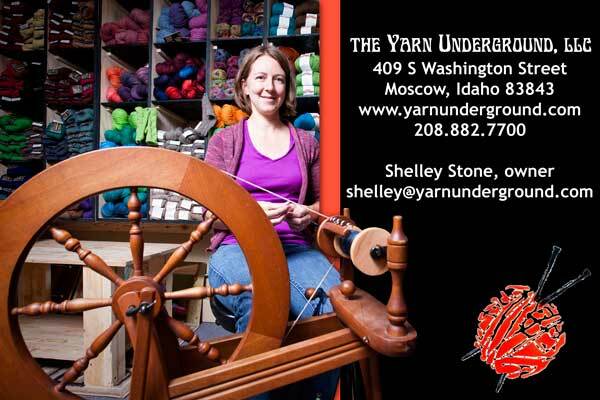 It is her sole purpose to make The Yarn Underground, LLC the best yarn shop on the Palouse.